The worst part about summer camp is that it often creates a lifelong obsession with the outdoors. I have always loved to swim and after learning to kayak at a summer camp in Vermont, I’ve based most of my major life decisions around access to lakes and rivers. 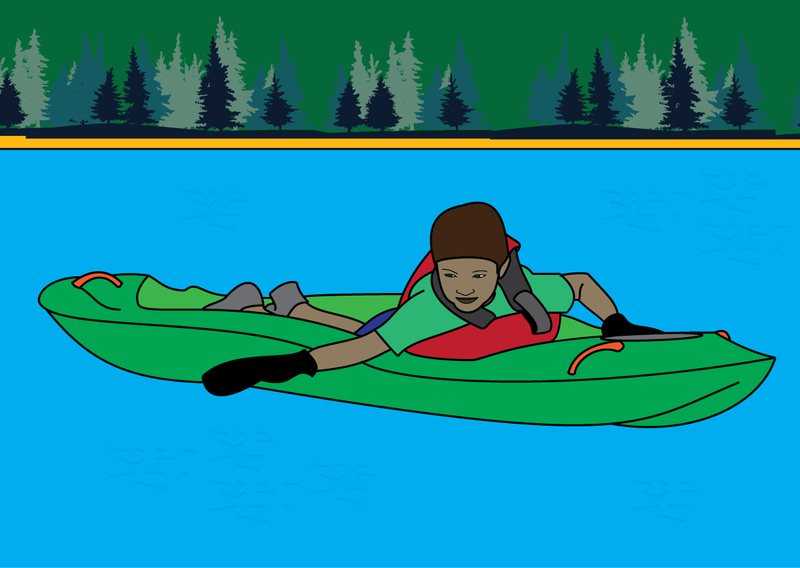 From playing kayak games on the lake to running rivers around the country, summer camp planted the seed. Who knows how my life could have turned out had it not of been for summer camp! How do we use these things? You get on, lie down and paddle with your hands. No extra gear. No cockpit to fill with water. No super heavy plastic thing to drag around. 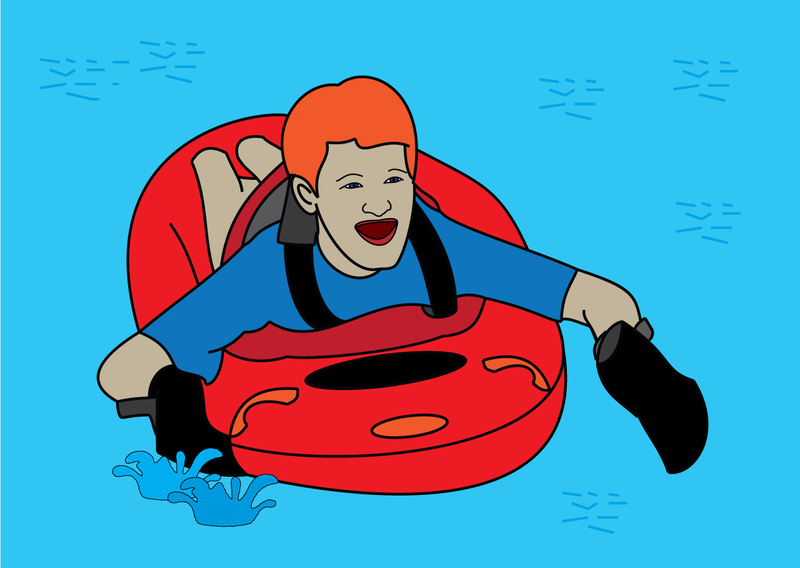 It’s exactly like swimming on top of a kayak. Your campers have all of the speed, thrill and skill progression of being able to navigate a boat, but with the ease and safety of prone paddling. Your campers will quickly learn how to navigate the bellyak, and will soon be competent prone paddlers. Here’s more on mastering the basics. Anywhere from 8-80…one boat to float them all. Your smallest campers can double up on one bellyak, and your older campers can use them for games, fitness challenges, and for those who do these sorts of things, whitewater. This is a version of Ultimate Frisbee in bellyaks, using a sponge instead of a Frisbee. It is best played with a large group. Split the group into teams, set the play area size to reflect the skill of your students and mark goals. One side will start by “kicking off” or tossing the sponge toward the opposing team. The opposing team will try to move the sponge down the playing area to the goal by passing the sponge to each team member. 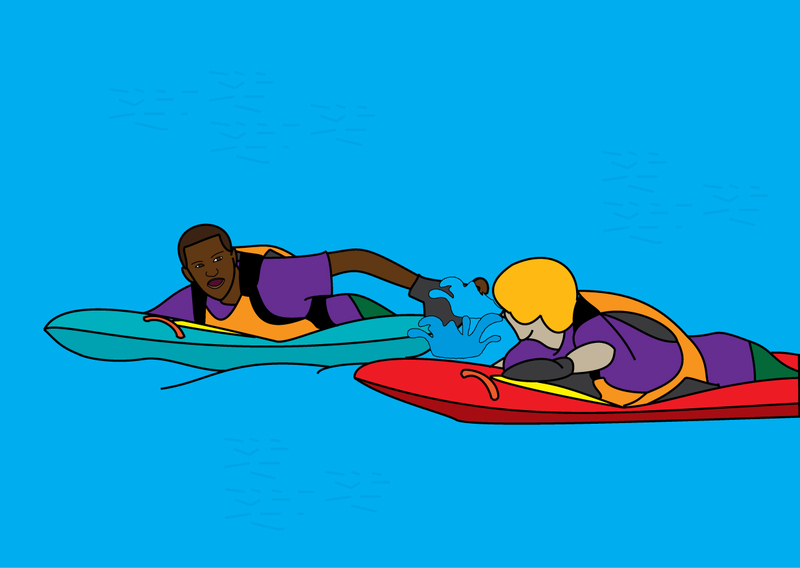 If you are holding the sponge, you cannot paddle, only pass off to another member of your team. The other team may block with their hands or bellyak, but try not to encourage bodily contact. Points are earned by getting the sponge in the goal. This is a great game to build teamwork and fitness. Used to practice switching edges and looking into the turn. Have the students spread out in a long line. One camper will start at one end and weave in and out of the other camper. When one camper finishes they become part of the line. Next a relay race, each team paddling one by one out, around their team’s adult boat and then back before the next can start. Do as a forwards paddling race, and then paddling backwards. Two teams of 4 (or more!) line up on opposite sides of the lake: when one person reaches the other side the other team sends a paddler back…the first team to have everyone make it to the other side wins. The most obvious bellyak trick would be standing up in the boat. Feel free to make up a story to correspond with this game. Dan is famous for his tale about a tribe of kayak people who had to stand up in their boats to pick fruit off of trees. Just make sure that other bellyakers are well away from the boats and that the water is deep enough. The challenge isn’t always standing up, but rather sitting back down. Also fun to try is handstands in the boat or turning around. 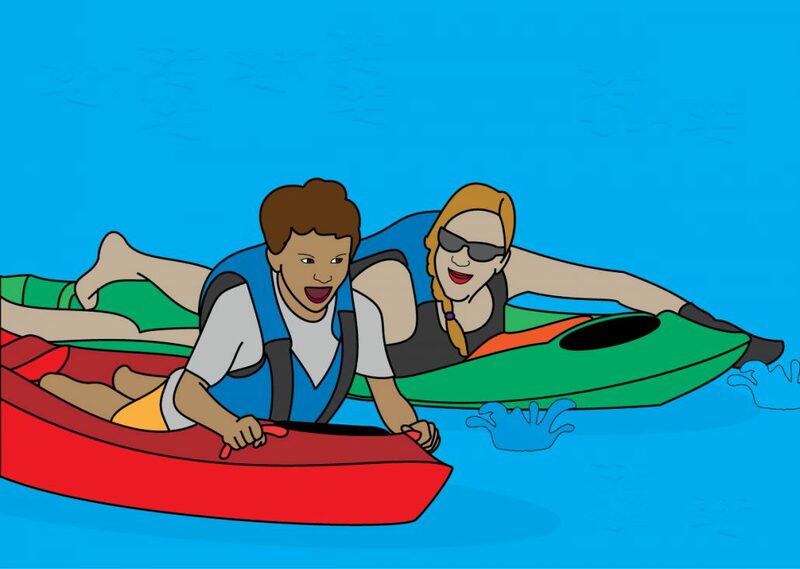 Campers can also buddy up and have one person paddling with the other person standing. Used to practice switching edges. You can set this up any way you would like. Say you are having try-outs for the Olympic synchronized bellyak team. Start paddling in a circle on edge. On the command “Zig”, sweep on the inside of your circle and switch the lean to the other direction. Continue paddling in this direction until you hear “Zag”, then sweep on the inside of the circle and switch leans. If you can get people to do this in formation they will need to control their direction change to be in unison with others. Each boat has a piece of duct tape on the bow and the stern of their boat. The goal of the game is to collect as much duct tap as you can while preventing others from stealing yours. Remember to set boundaries and determine how much chaos you are willing to handle. This is a great game to get campers to burn off extra energy. Do you want to know more about how bellyak can make your camp better? Contact us today for our stellar camp pricing!